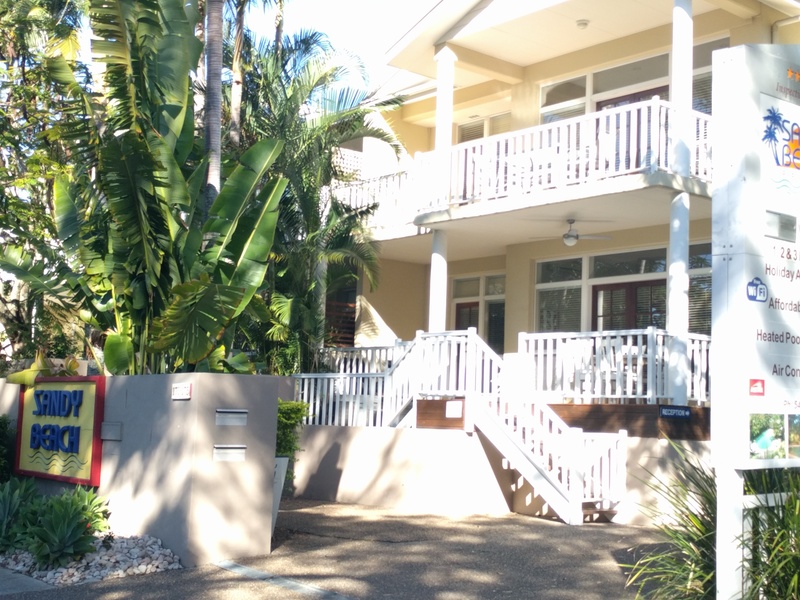 Sunshine Coast! This was our longest car trip to date. 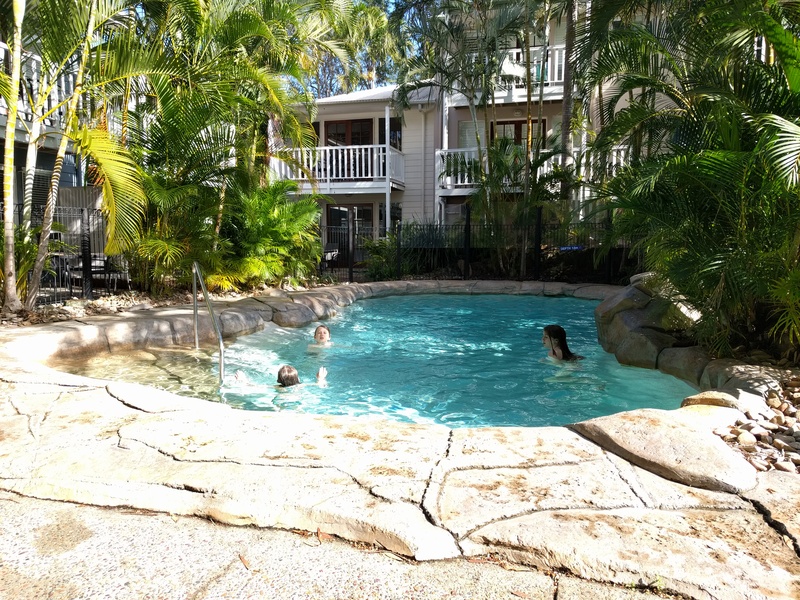 Byron Bay to Noosa. And this was the longest leg of our gypsy journey (8 nights.) Since it was so long, I am not going to do my usual daily journal type of blog. It was a long trip, but it seriously flew by. 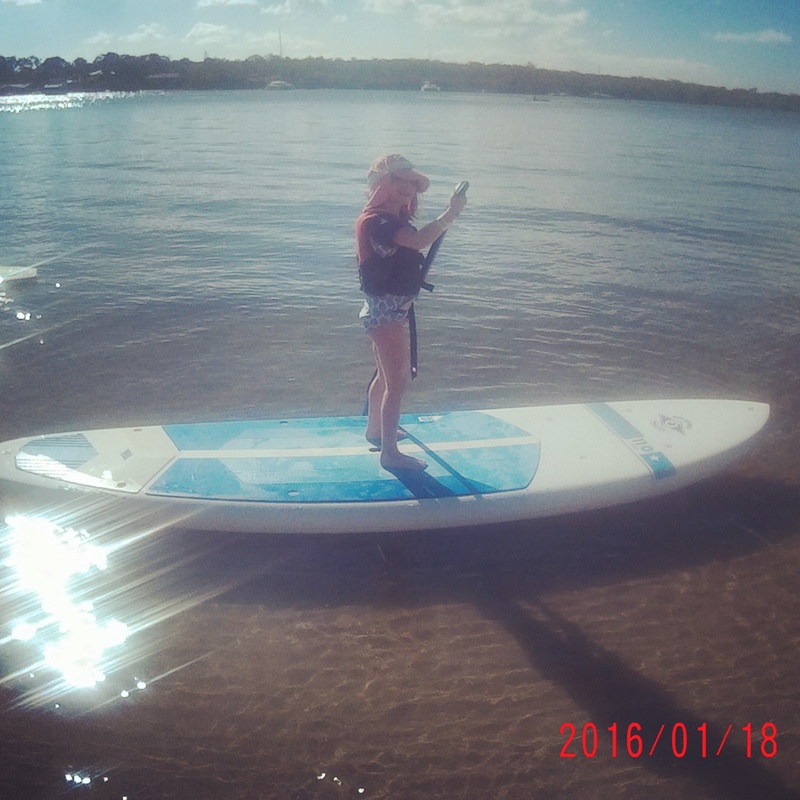 I absolutely loved Noosa and I was finally allergy free. PS. You can’t buy Noosa yogurt here, but it is named after this place and made in Colorado! There is some yummy and similar yogurt here in Queensland. Woke up the next morning and I had no idea where we were. It is so funny when we arrive in the dark and wake up to a whole new world. 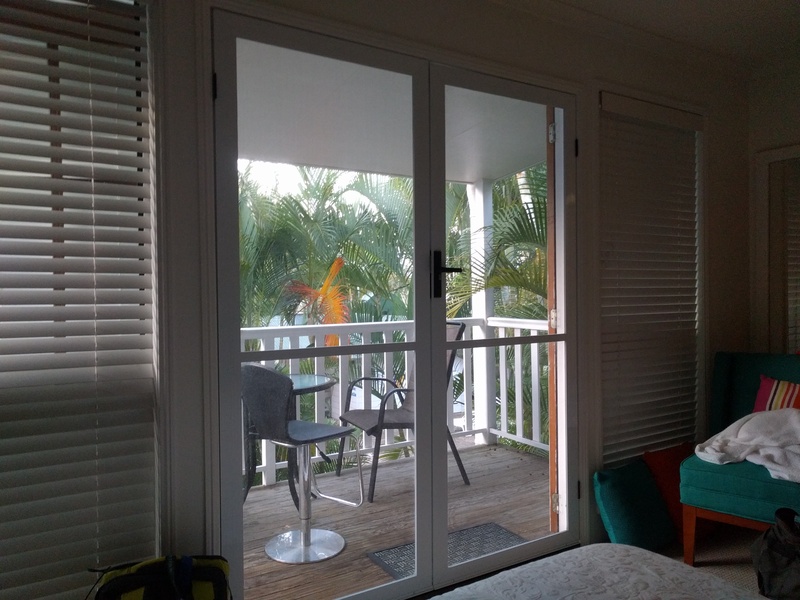 Luckily, we woke up to sunshine and a happy surprise at what a great location our place was in. I walked across the street and there was a long stretch of water. 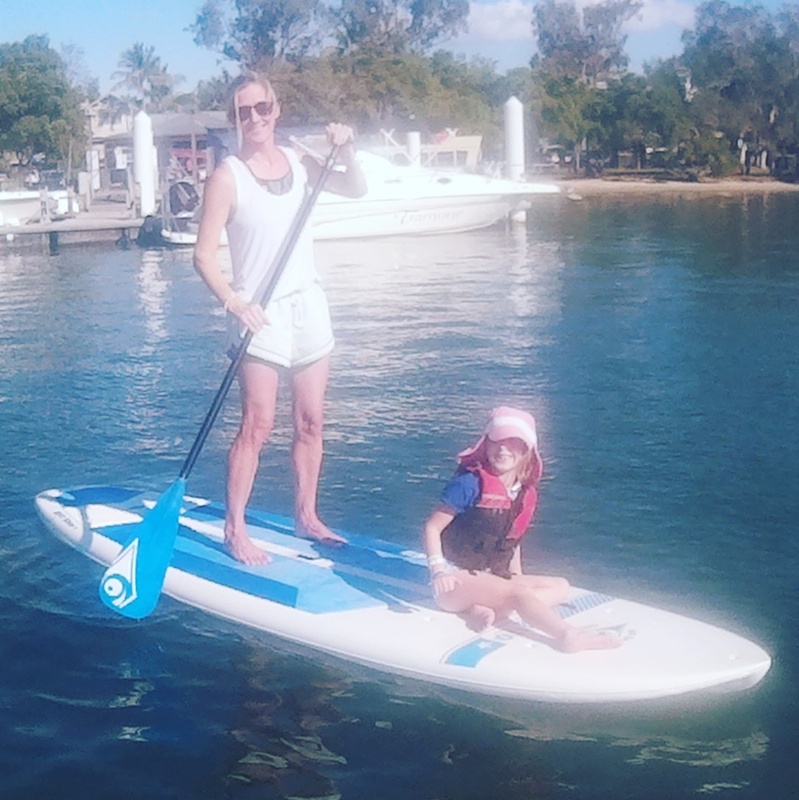 Noosa River. 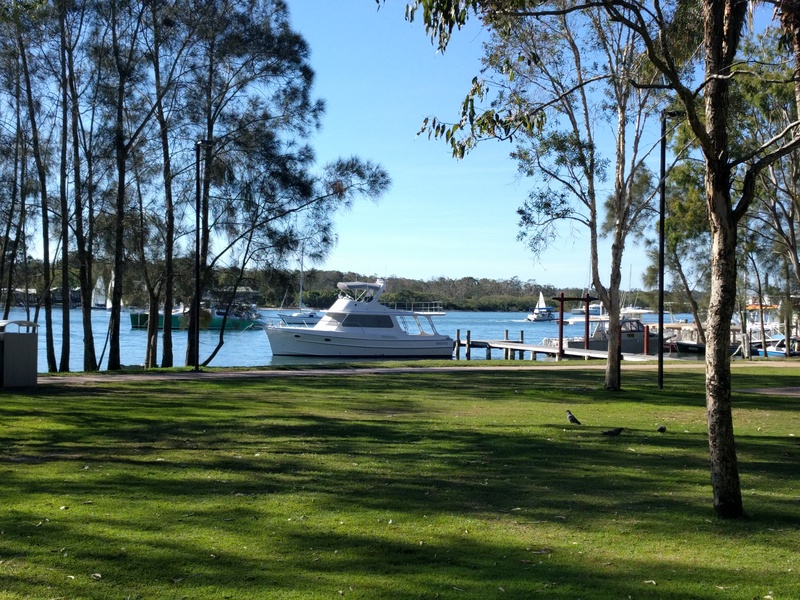 Along the river was a little bit of beach, walking paths, restaurants, parks, docks and boat rental places. It was so cute. 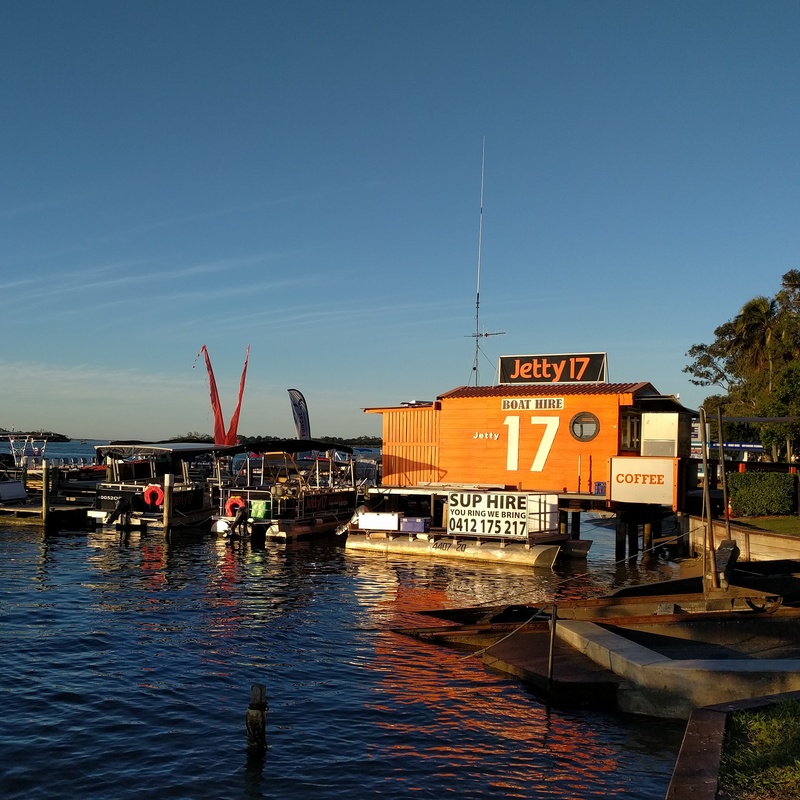 I headed to a place called the Boathouse for a coffee. I had to cross a little bridge/dock to get to it. The Boathouse was like a barge. While I was crossing the bridge, I noticed big fish swimming on either side of me. There were a few people gathered at the shore looking at something. 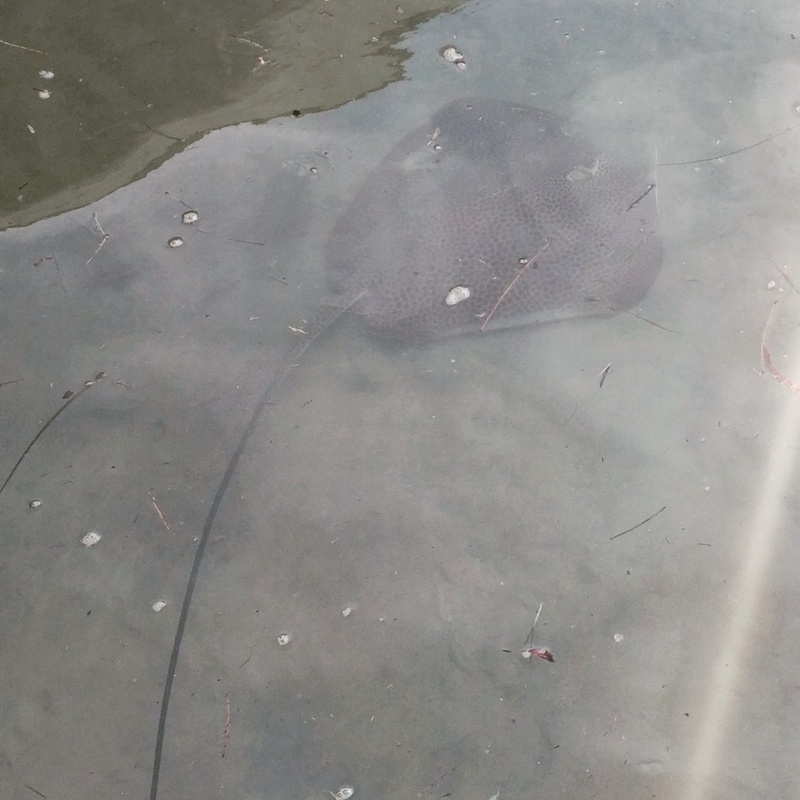 It was a sting ray! 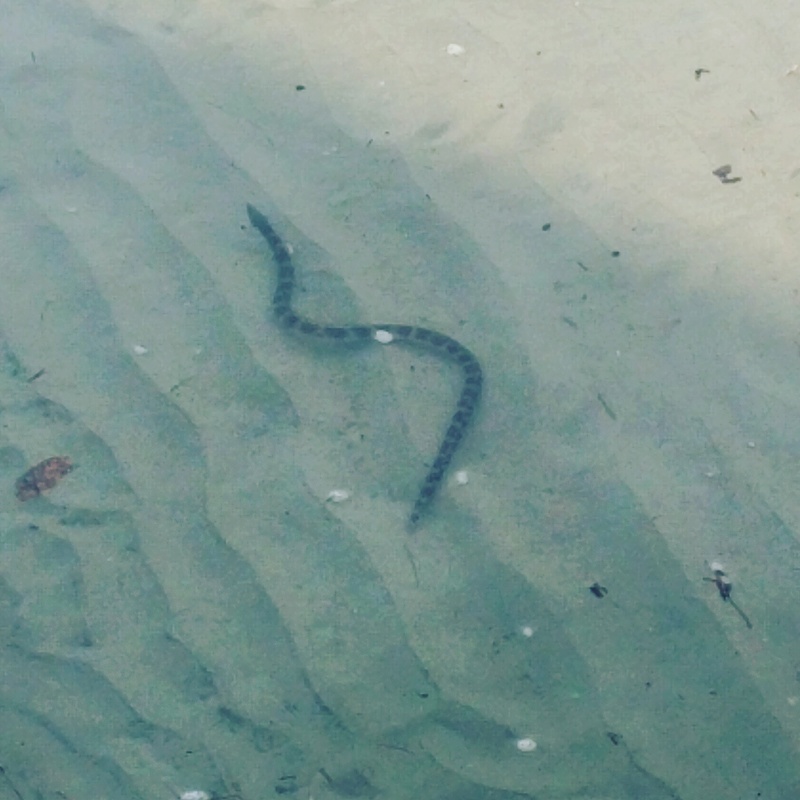 And a sea snake! AHHH! It was 7am. Too early for deadly sea creatures. Guess swimming in the river was ruled out. The locals seemed excited to see these guys. I was still trying to get my head wrapped around where I was. Got a coffee and some baked goods to bring home. On our side of the road there were more shops and restaurants. Woolies (grocery store) was around the corner, so I was able to walk. Nope…still not driving yet. At this point, I can’t drive in any country or on either side of the road. On the first night, Wes was grilling by the pool while the kids swam. I ran across the street to see the sunset. By the way, it is still winter so the sun sets sooooooo early. Like 5pm! In June. So weird. The days are going to feel so long when we get back to USA. 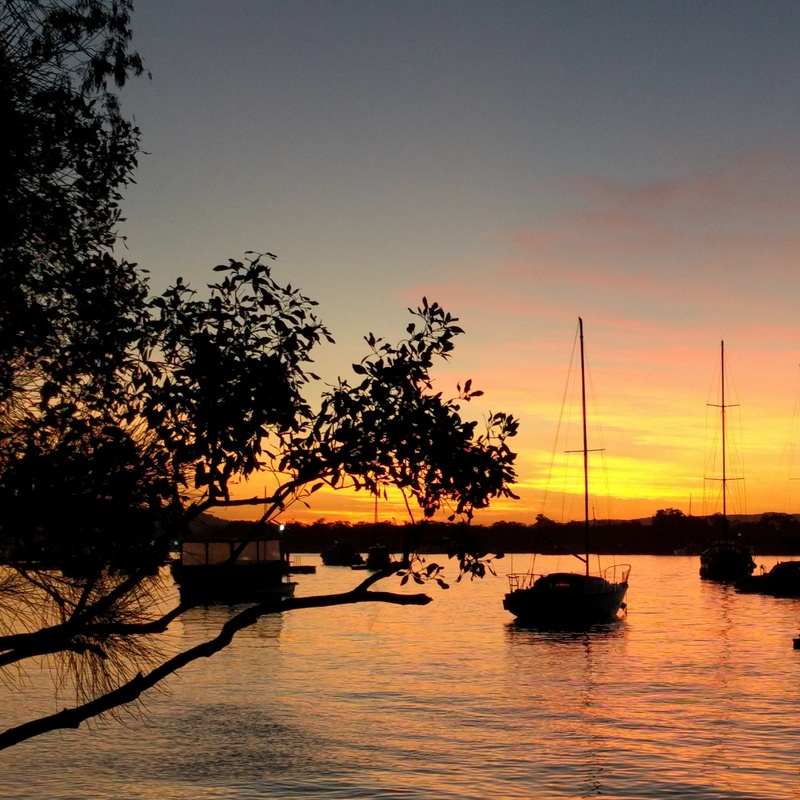 The sunset over the river was stunning. But that wasn’t the main event of the night. THE BIRDS! I can’t even describe it. I brought Elle back to see it the next night. I tried to video it, but it didn’t really capture the craziness. Hundreds and hundreds of birds came flying by and sat in trees and were so loud. I couldn’t hear Elle talk next to me that’s how loud they were. And they just kept swooping over us. Lorikeets and cockatoos were the main attractions. It was a bird party. The first night I had to stop and ask someone what was happening. Everyone was acting like this was normal. The lady I asked told me this happens every night at sunset and every morning. 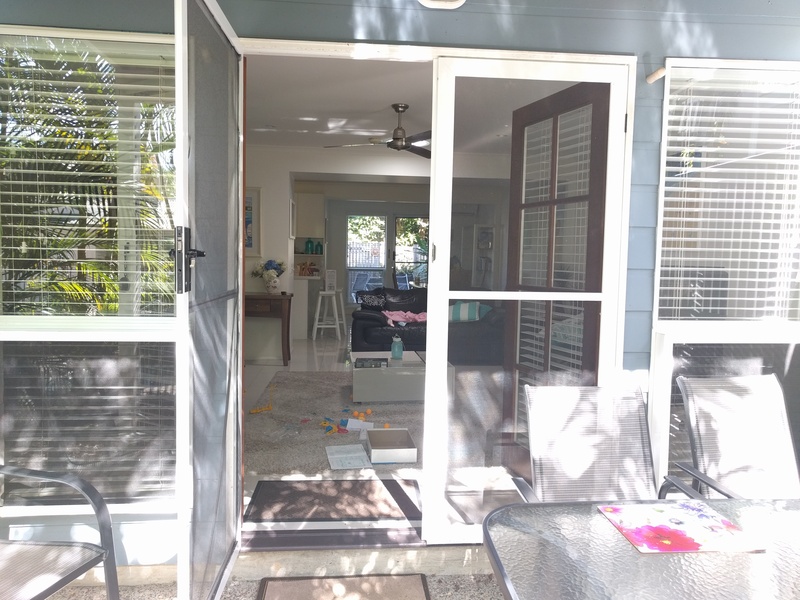 We could hear it a bit from our house, but nothing too disturbing. 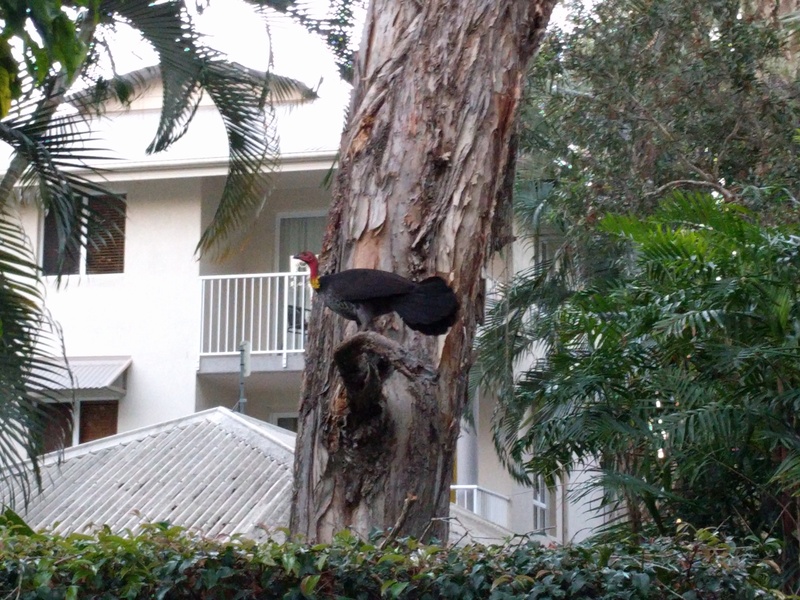 Bush turkeys are everywhere. 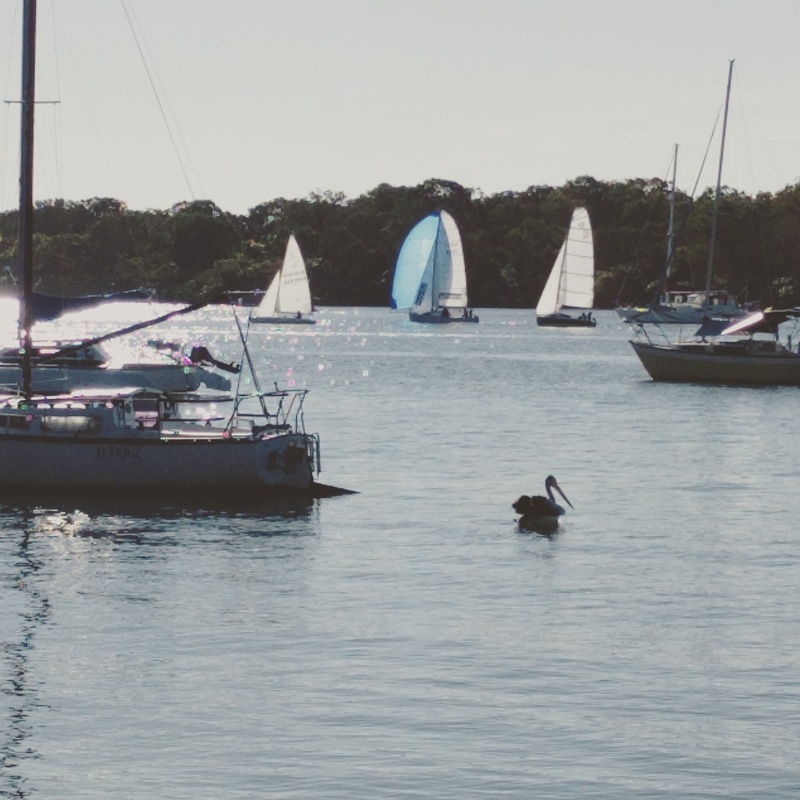 At the pool, on the sidewalks, on the beach….they are funny birds. 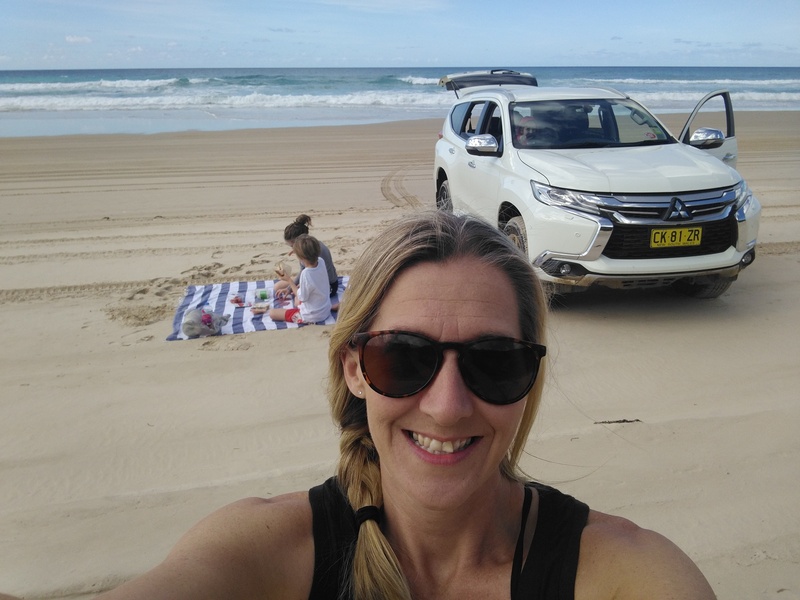 On our 2nd or 3rd day, we took a drive exploring the different beaches and national park in Noosa. 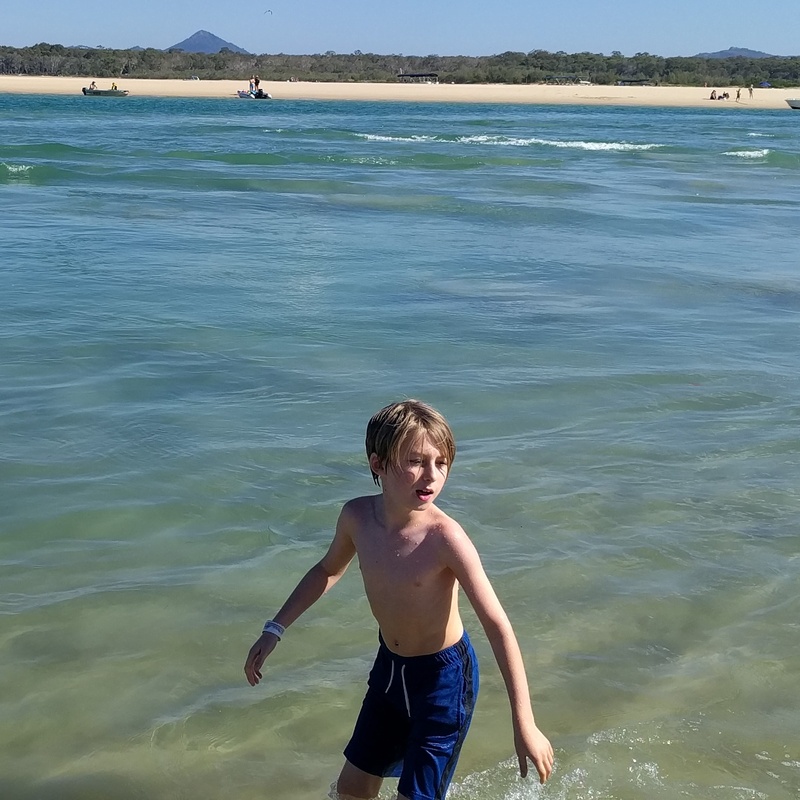 We ended up at the Noosa Spit down at the end of one of the main beaches. This was an unleash dog beach and there was a wild current and sandbars that made us sink. 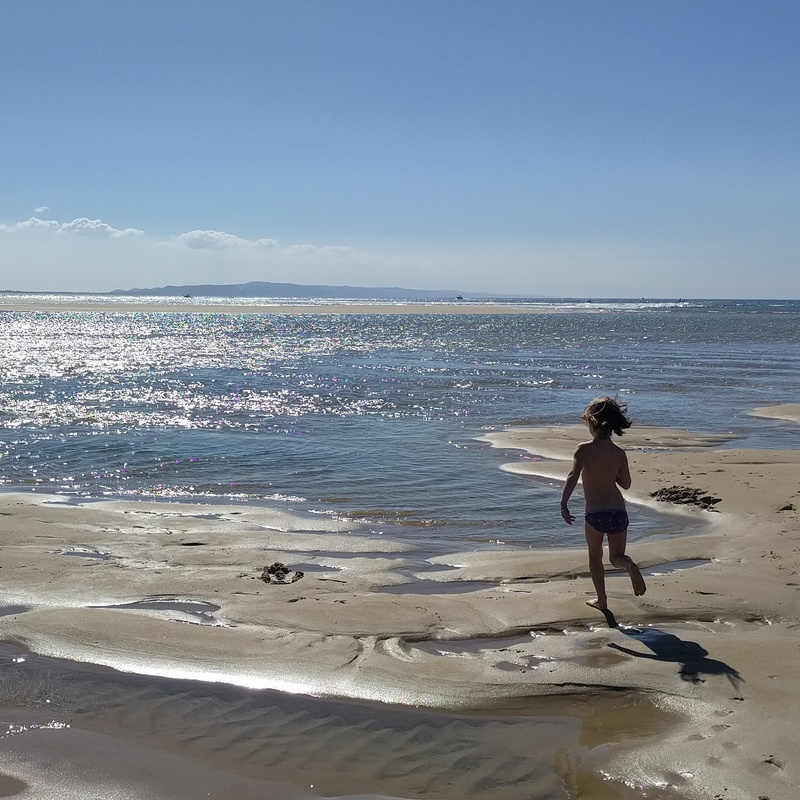 The kids didn’t have swimsuits on, but Luke and Mae stripped to their unders and jumped in. They couldn’t help themselves. 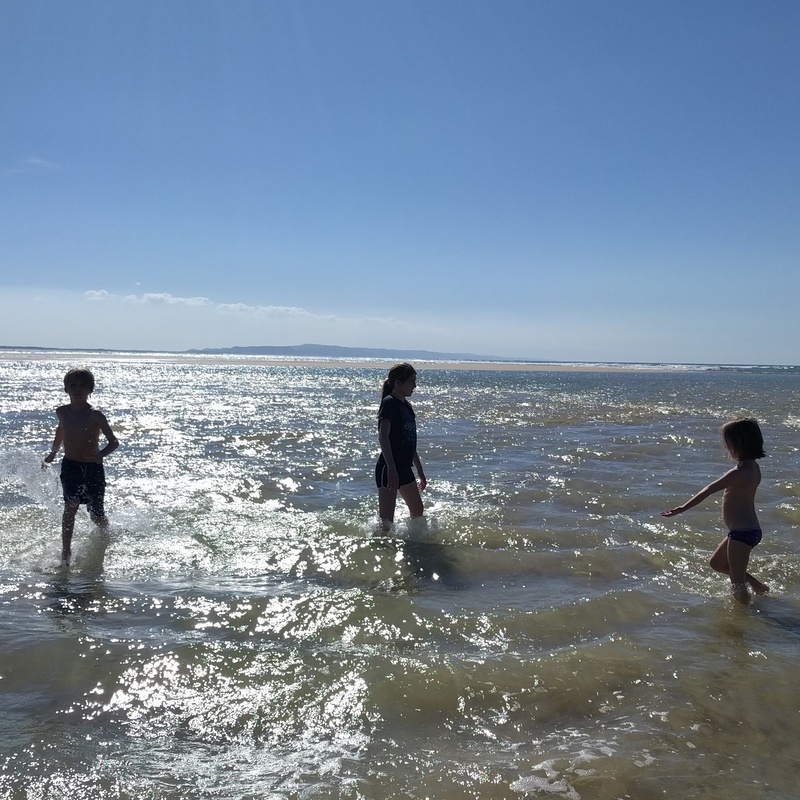 In Sydney, our beach had big waves. This was more like a pool. It got deep right off the shore and the current pulled you to shallow waters. They had so much fun. The water was a gorgeous color. 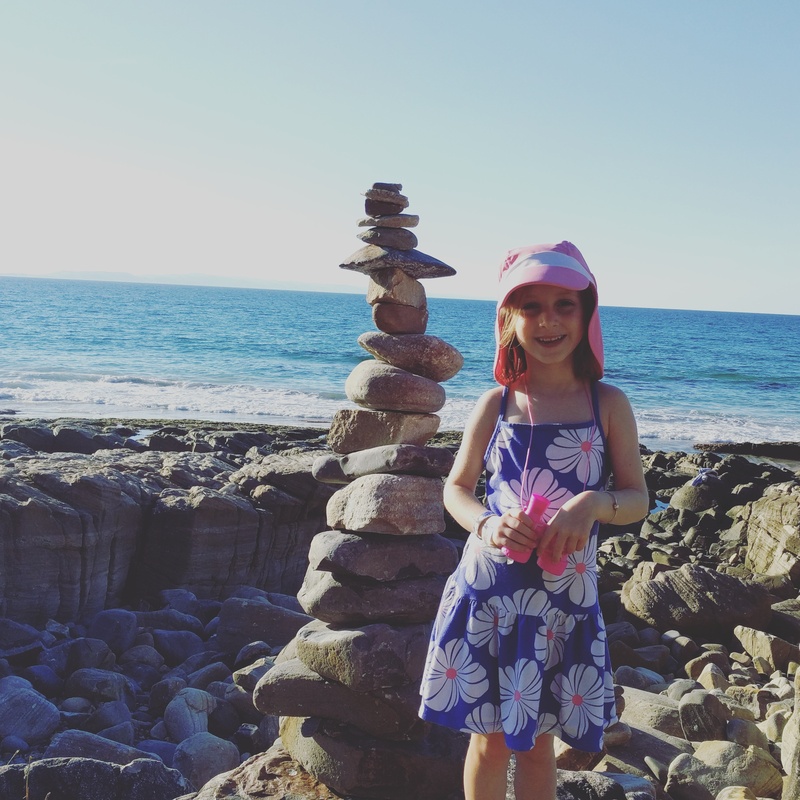 The next day, Mae and I did a nature walk through the park along the coast while Wes and big kids went back to the beach. The weather was beautiful and we were enjoying nature. TUESDAY! 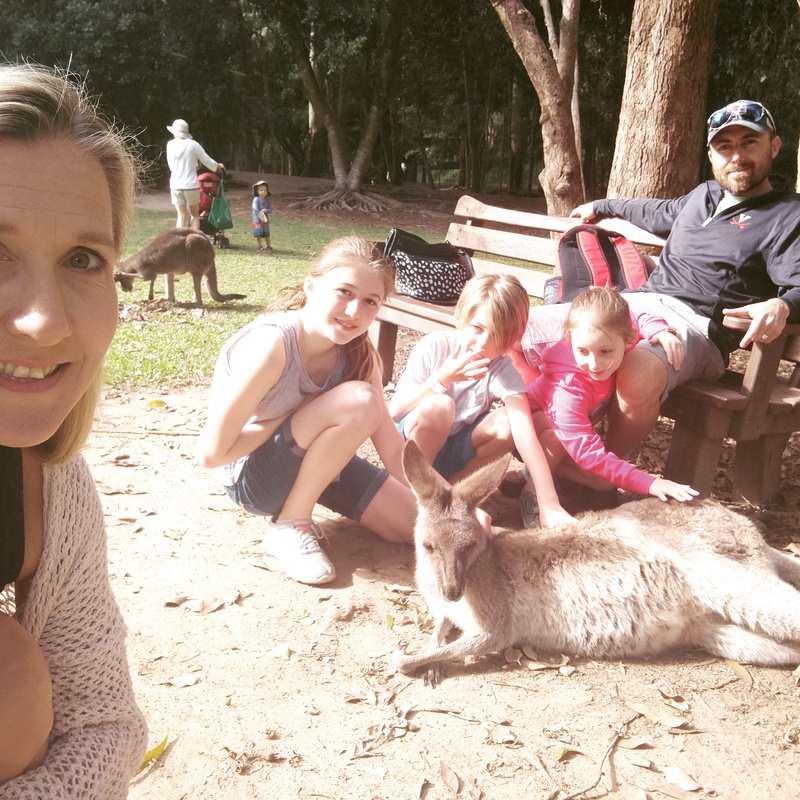 AUSTRALIA ZOO DAY! 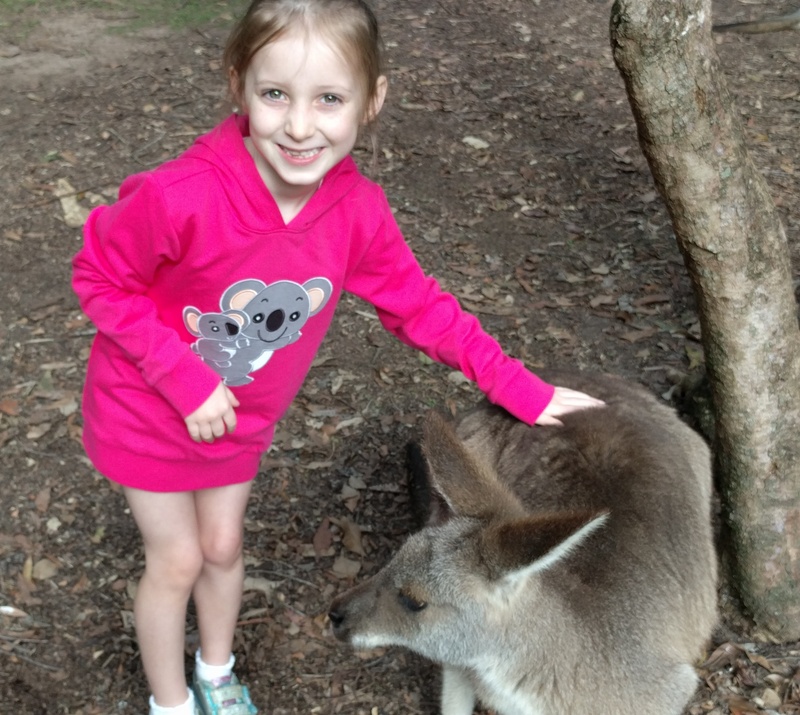 Koalas, Kangaroos, and Wombats…..Oh My! 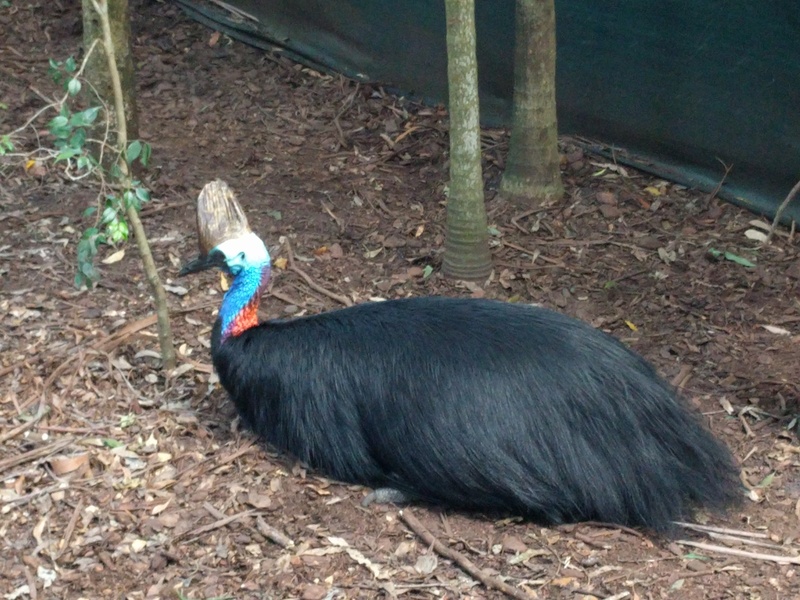 We drove about an hour south to THE zoo. 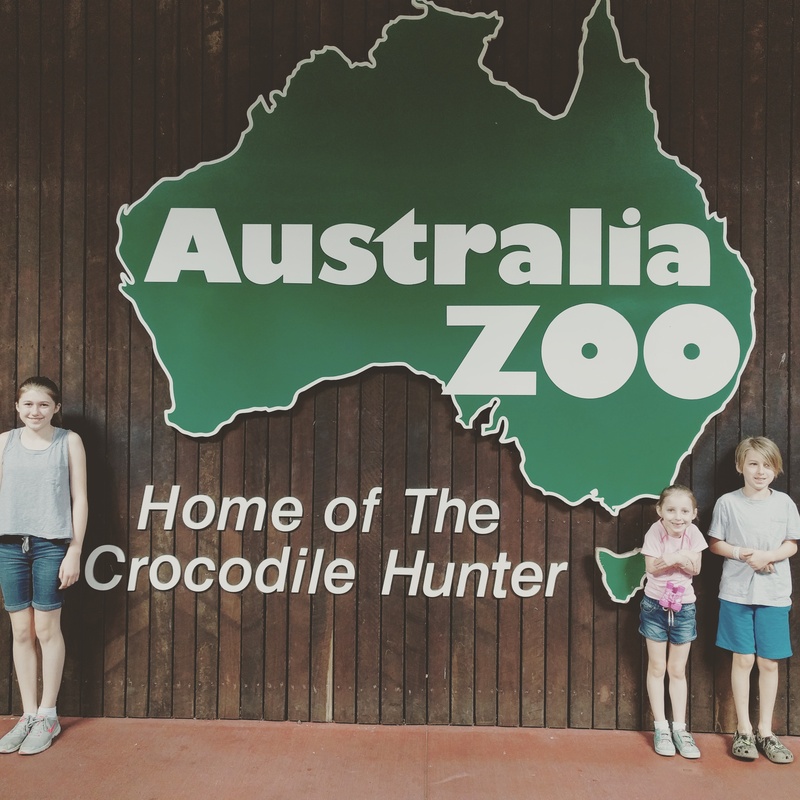 This is the famous zoo of Steve Irwin, The Crocodile Hunter. My kids don’t know him at all. BUT they do know Bindi. She hosts a show we watched where kids compete at the zoo in challenges. They were excited to see the zoo for THAT reason. Ha! 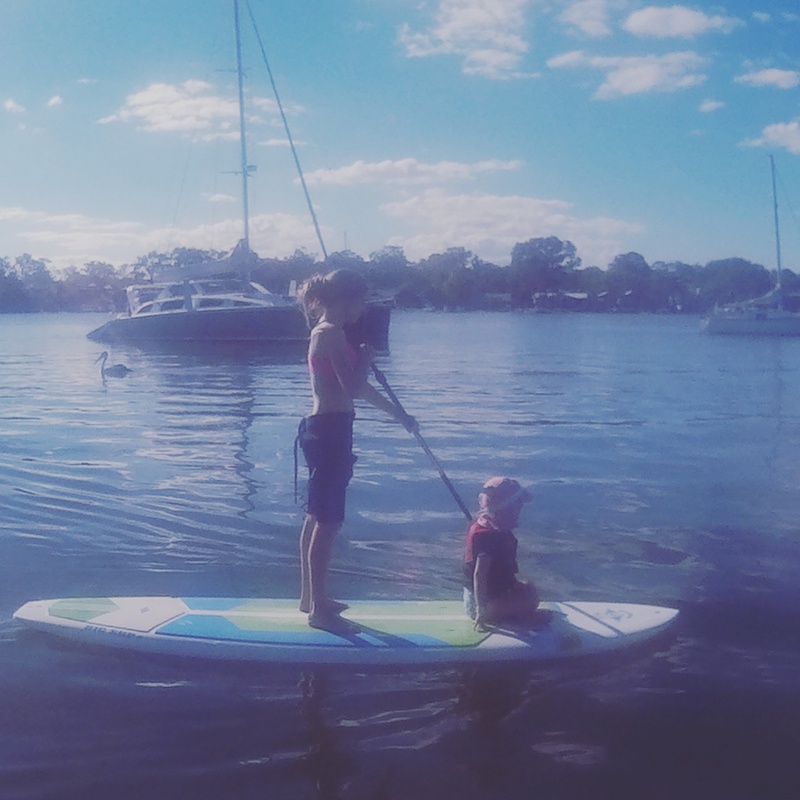 We had a membership (thanks, Daddy!) to the zoo in Sydney and that was super fun. 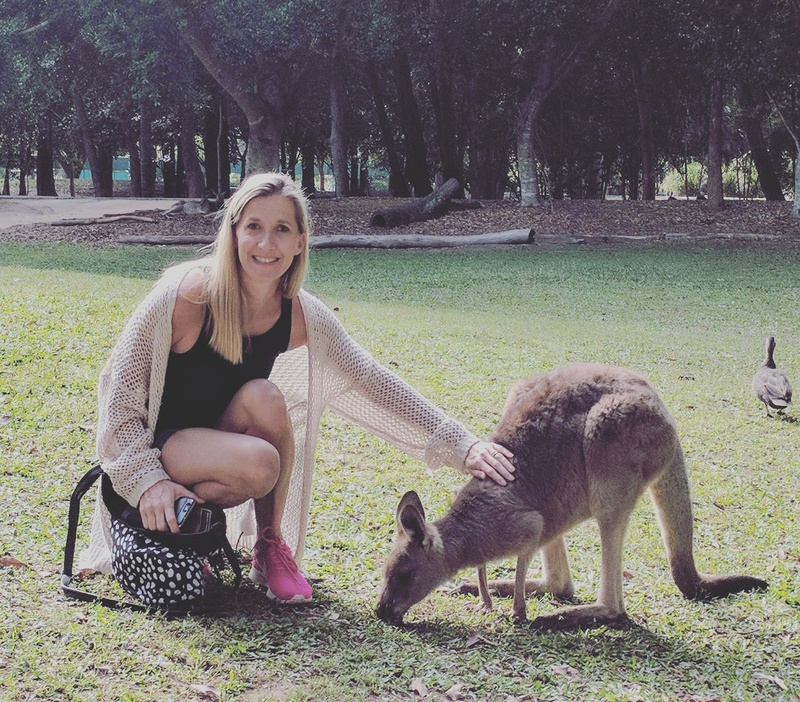 We love seeing Aussie animals the best. 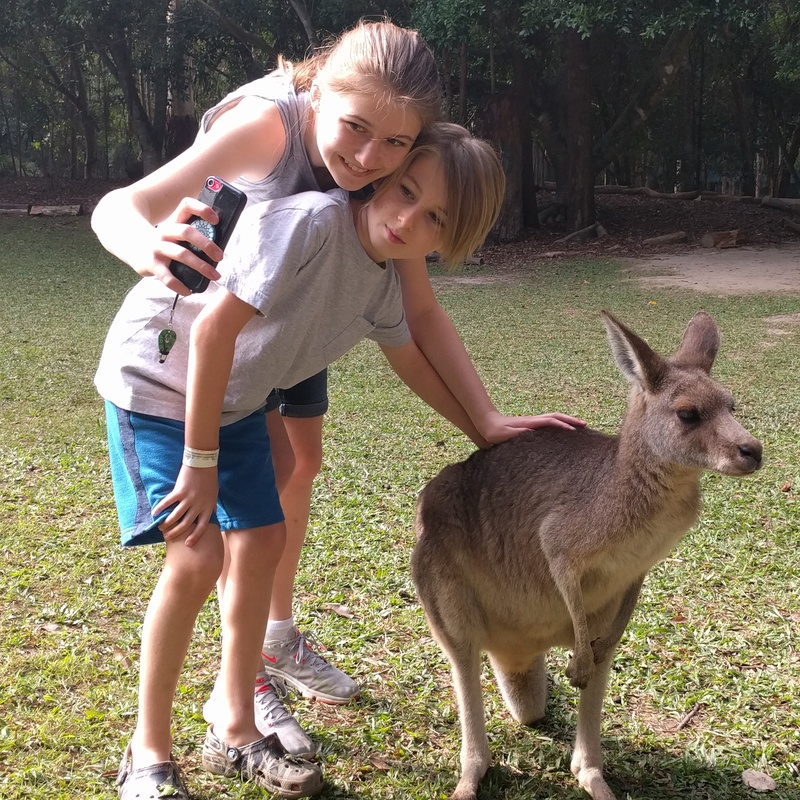 We had heard great things about the Australia Zoo. So, we did it and I am so glad we did. 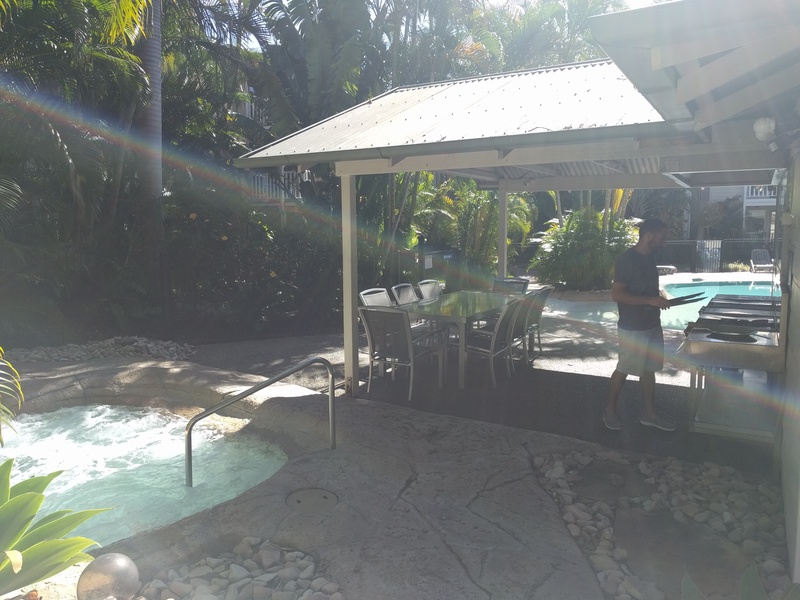 Unfortunately, Wes began to get sick as soon as we arrived and continued to go down hill during our time in Noosa. 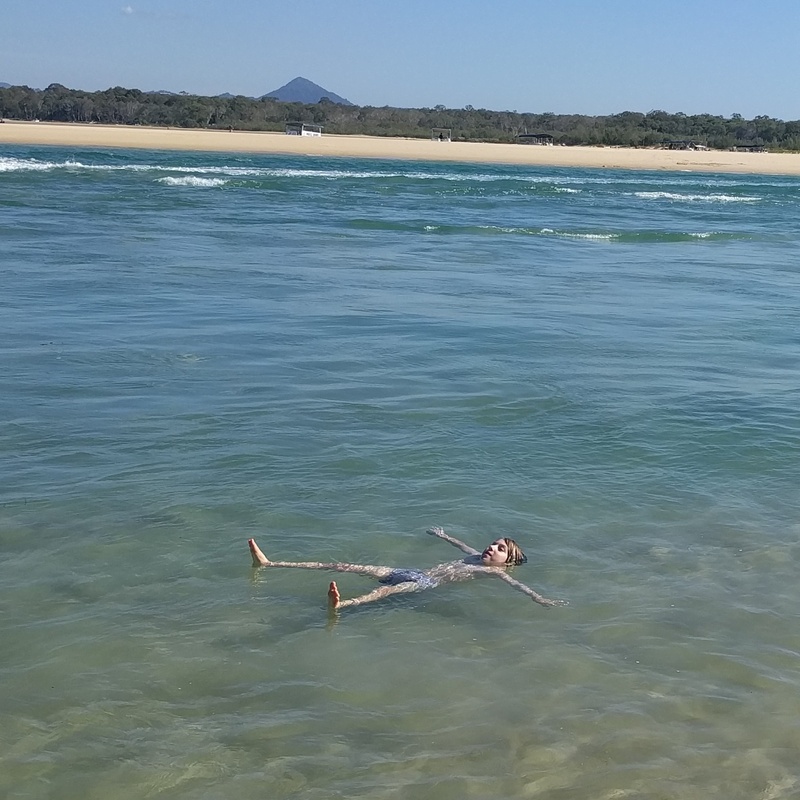 So while I loved, loved, loved Noosa…our trip was not as fun with one of our teammmates down for the count. 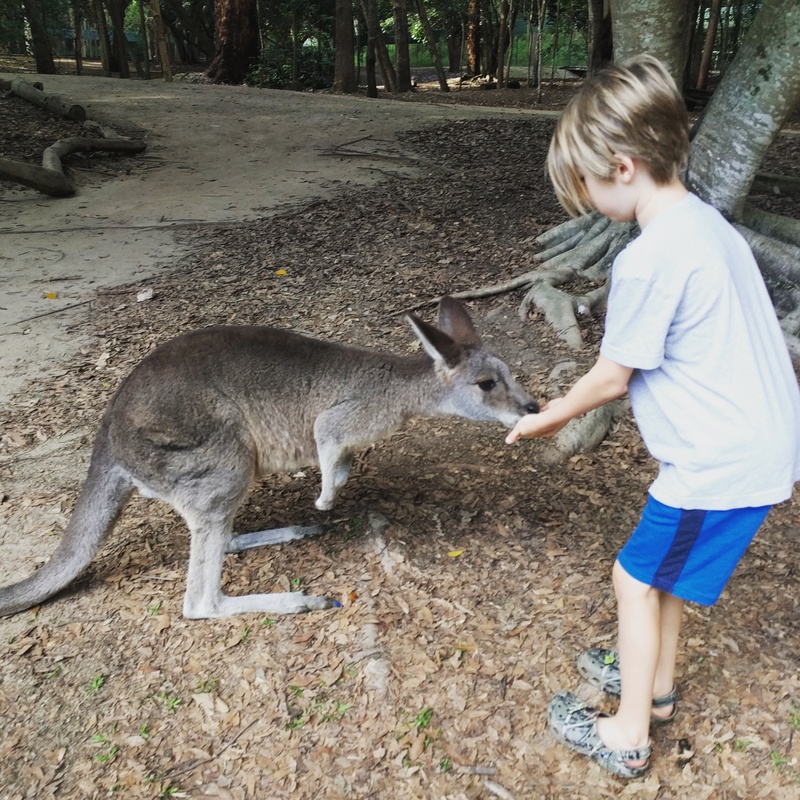 We were able to pet and feed kangaroos. That was an amazing experience. Once in a lifetime. 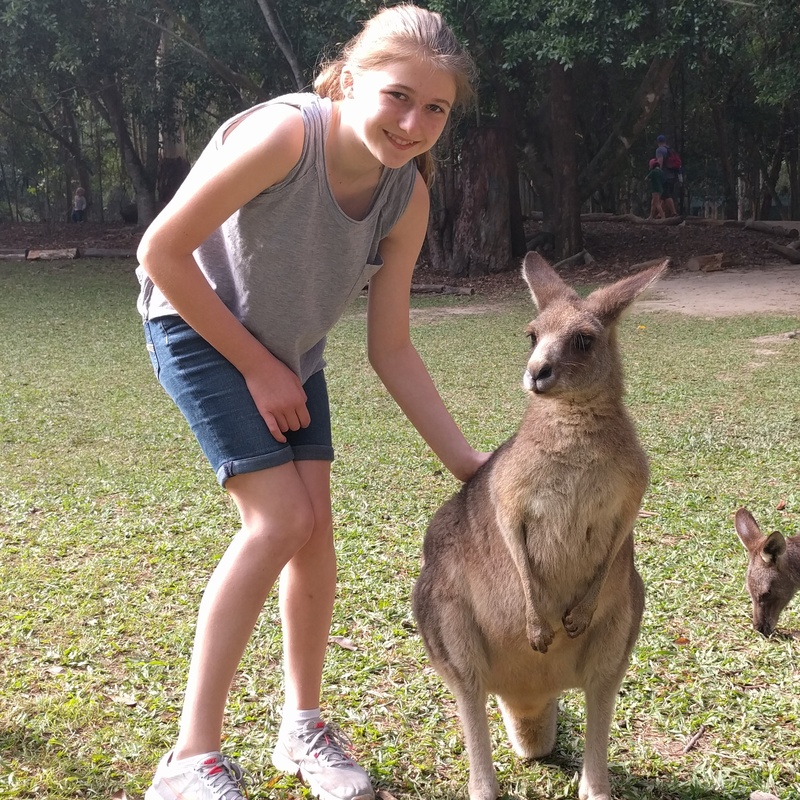 We spent quite a bit of time with the roos because it was so fun. 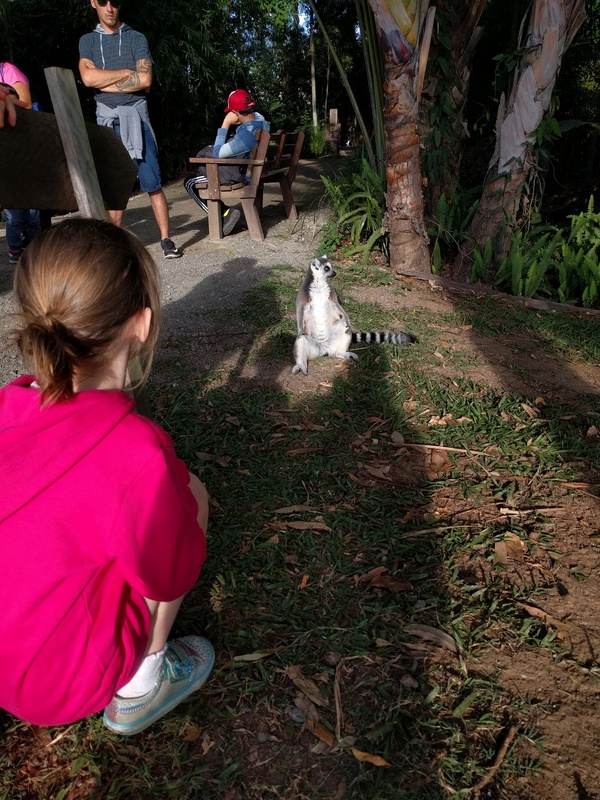 We also liked lemur island where 10 lemurs were just running around. 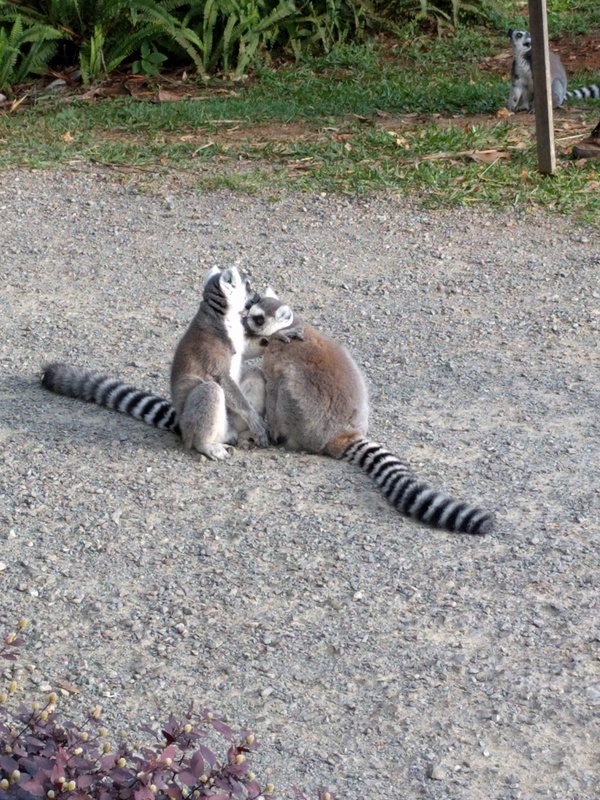 They were so playful and adorable. 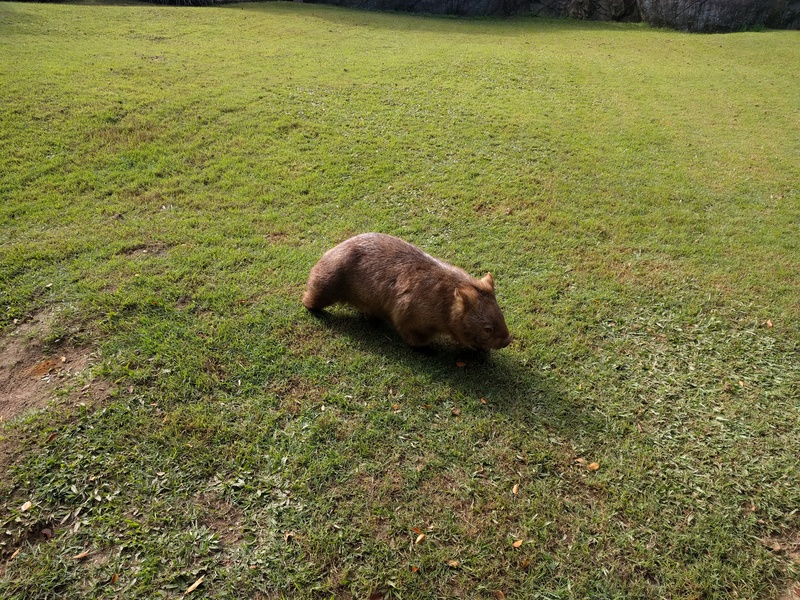 We saw a wombat and a cassowary and of course, crocs. We saw some that Steve had caught himself. We did see one animal show that was very fun. Now for the best part…koalas!!! 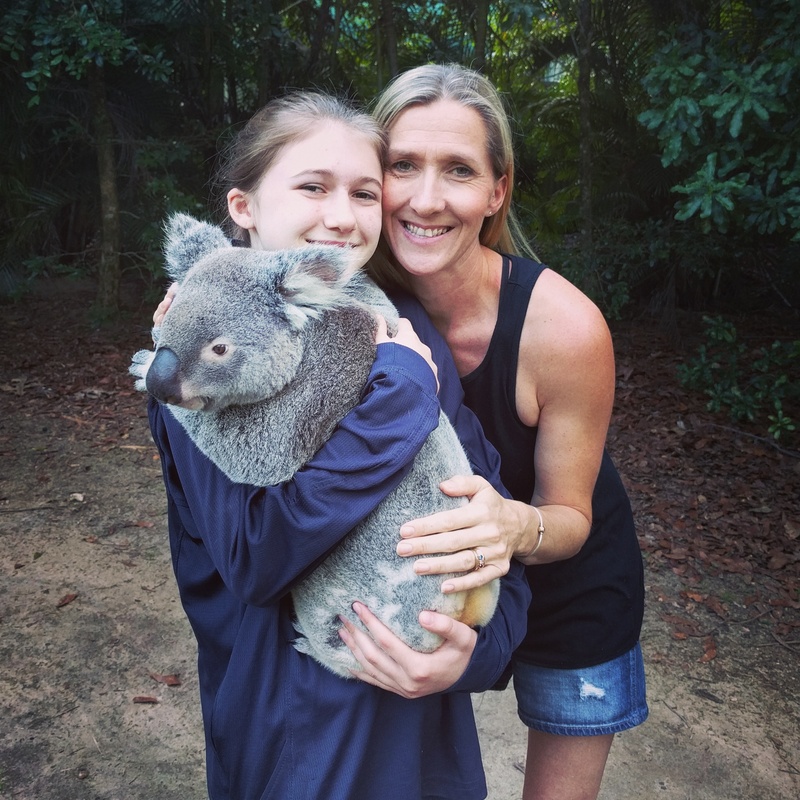 When in Australia…we hold koalas. Before I talk about the koala cuddles, I have to give a little background. 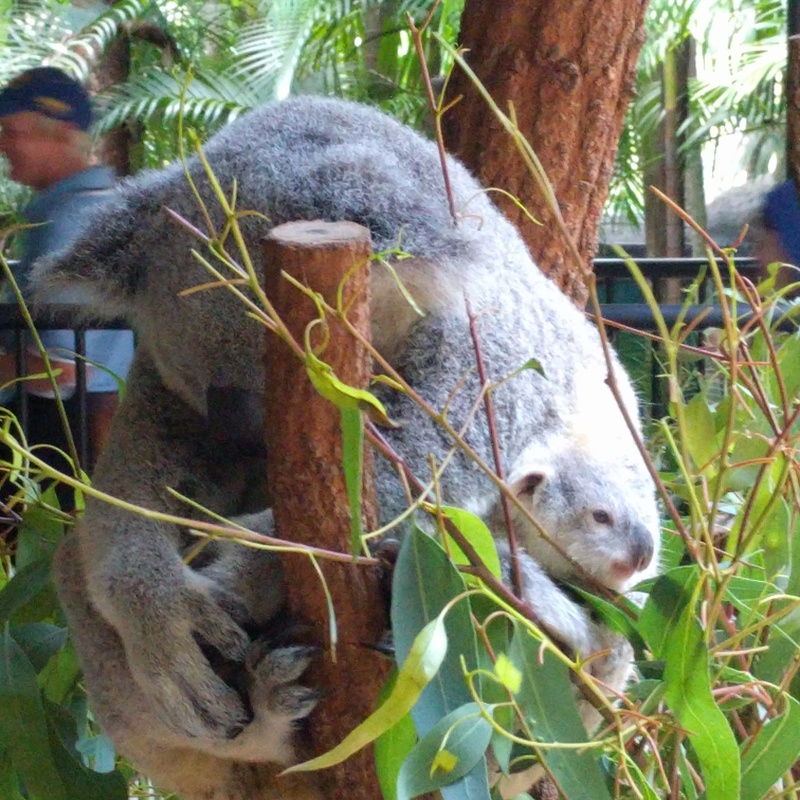 At the zoo in Sydney, we learned that koalas are not social animals and they like to be alone. We also learned that just because something looks cuddly, doesn’t mean they like to be cuddled. 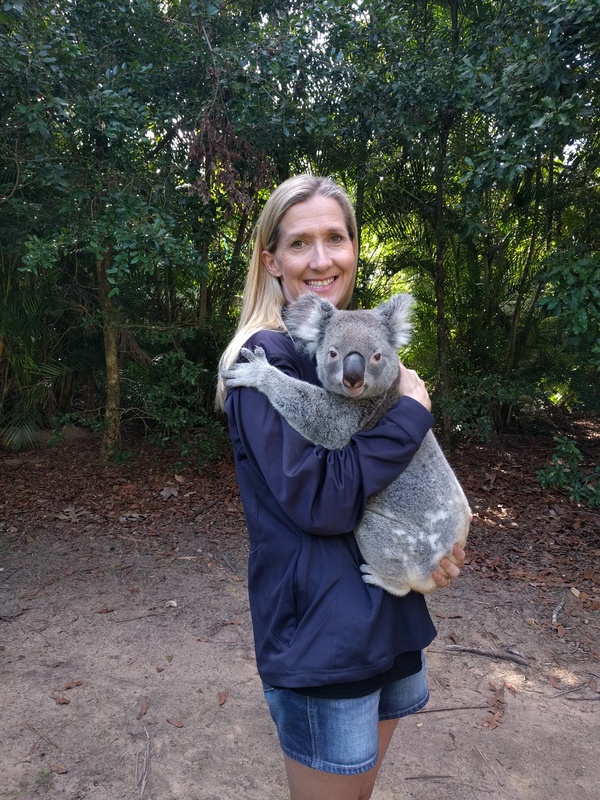 It is actually not legal to hold a koala in New South Whales, but it is in Queensland. Because of this, Wes had no interest in holding one. The age limit was 8, so Mae couldn’t do it. 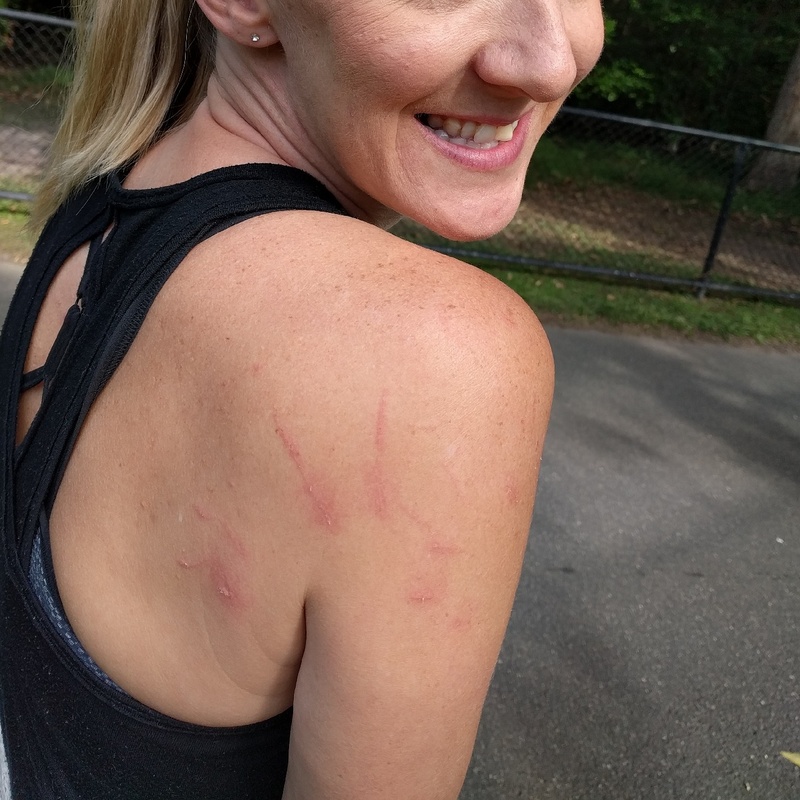 Luke said no because of the claws (good call on his part….OUCH) and Elle was all in. 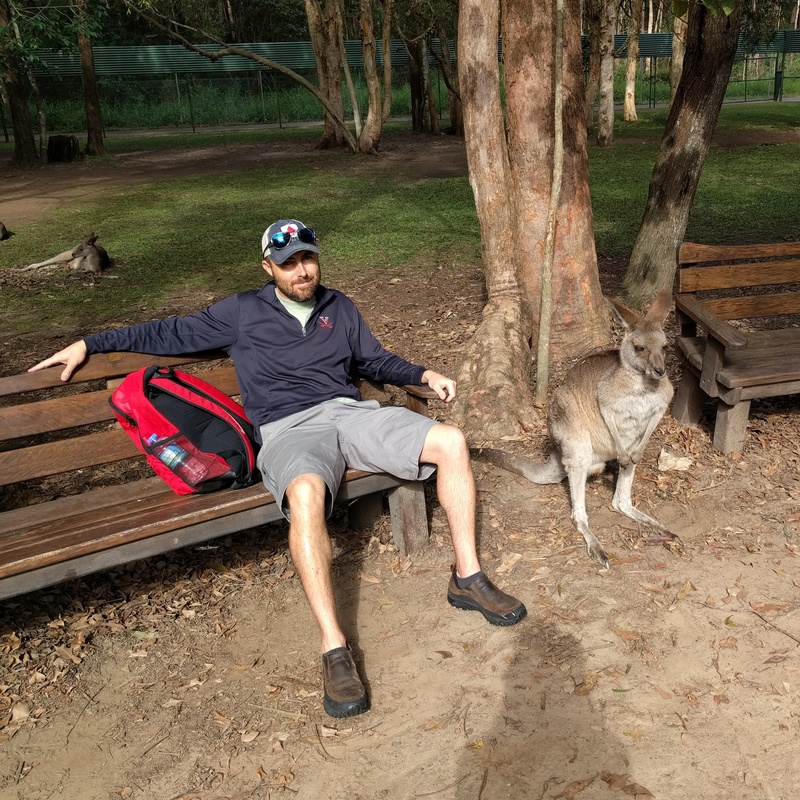 So before we went to the zoo, I signed us both up for the “koala encounter.” This encounter was for 4 people to spend some time with a koala…..cuddling and taking pics. 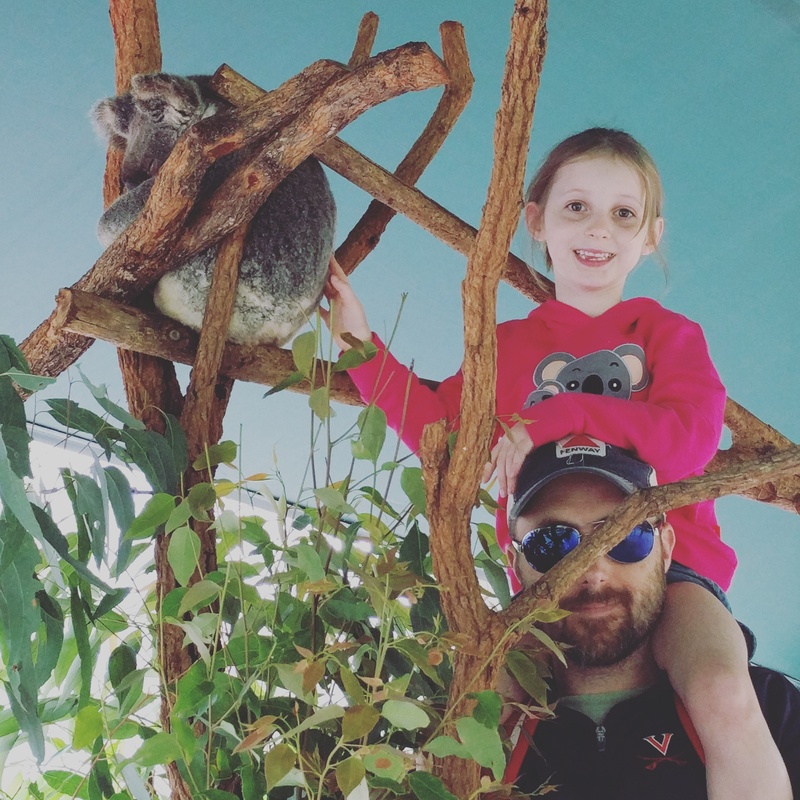 The good news is that there are koalas all over the zoo. Mae and Luke and Wes were able to pet one. 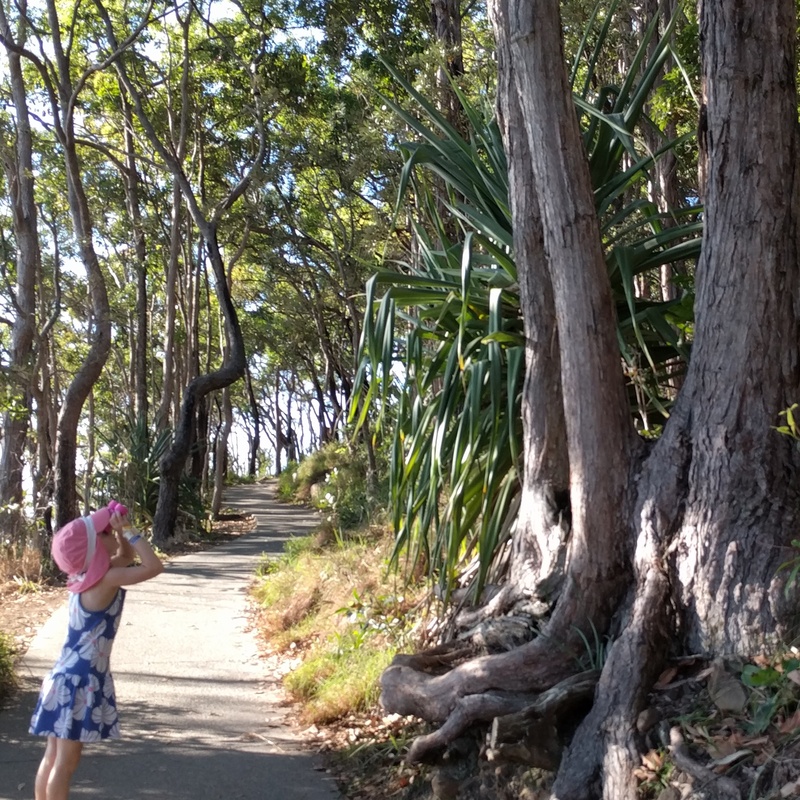 We saw all the mommy koalas hanging out together and even saw a little joey pop his/her head out of a pouch. We saw many workers walk by holding the little guys. 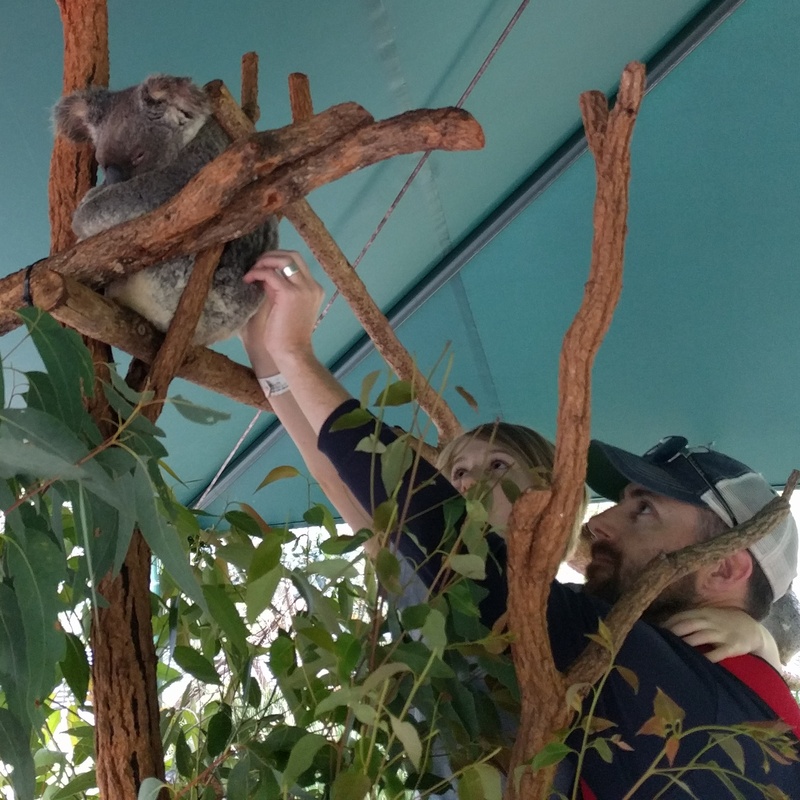 They were a big part of the zoo, so we all got to know the koalas better. Elle and I went out back to a field area where they hold the animal encounters. 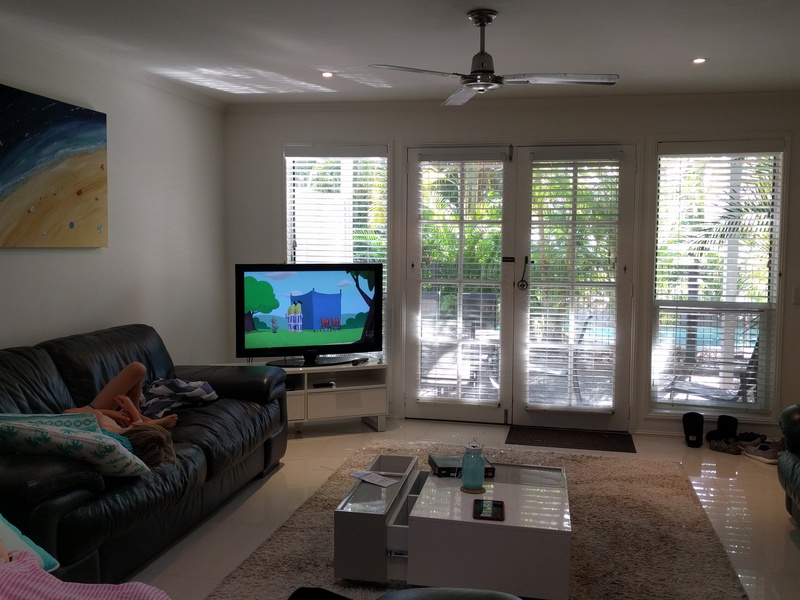 It was quiet and we were with a nice, young couple from the UK. There were two ladies working with us and the koala. There was someone there, also, to take pictures. We got to hold him twice. His name was Nitro. 3 years old. First thing I noticed was his smell. The makes have a strong scent for marking trees. They get smellier the older they get. We smelled like eucyltups for the rest of the day. Elle held him first and then me. After the “formal pictures” were taken by the zoo (we didn’t buy any of them but we have the proofs), we all got a 2nd hold for a little longer and we could then take our own photos. Wes and the kids were not far away. We decided to steal Wes’ jacket because Elle and I had on tank tops and OUCH. His claws just dug into us. It was much better with the jacket for our second hold. He was heavier than I expected. They look like little fluffy balls when you see them in a tree. But Nitro was solid. And we loved him. He seemed to actually have a personality. I read on the website that he became a father recently. I’m so glad we did it. I still have koala scratches 4 days later. We will never forget Nitro. 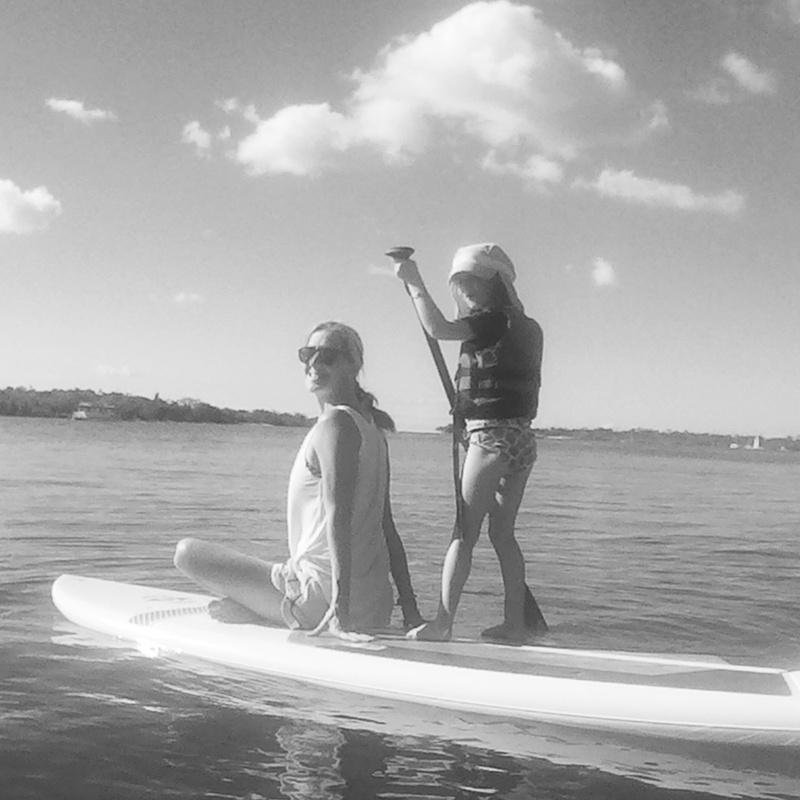 For Elle, this was a dream come true and a mic drop for our Oz travels. She came. She saw. 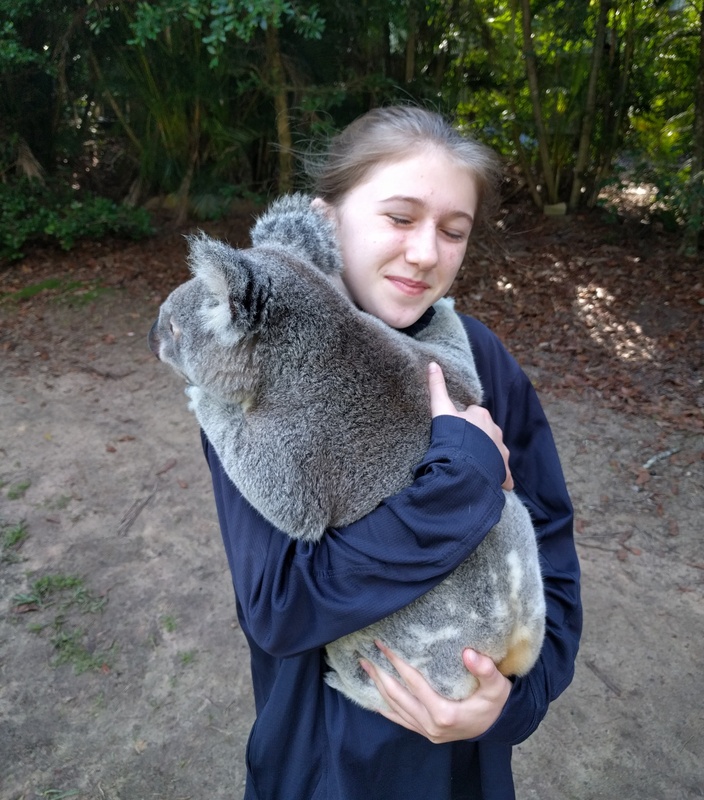 She held a koala. Thursday! 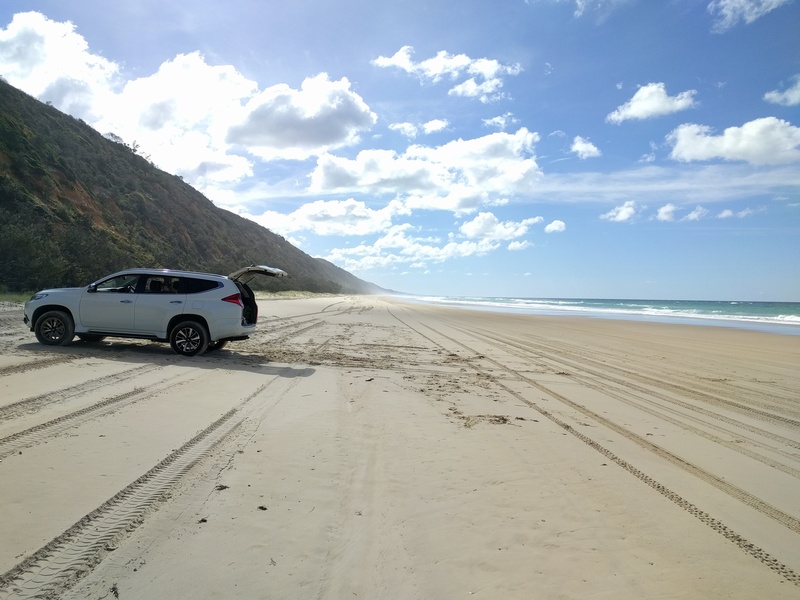 Great Beach Drive. 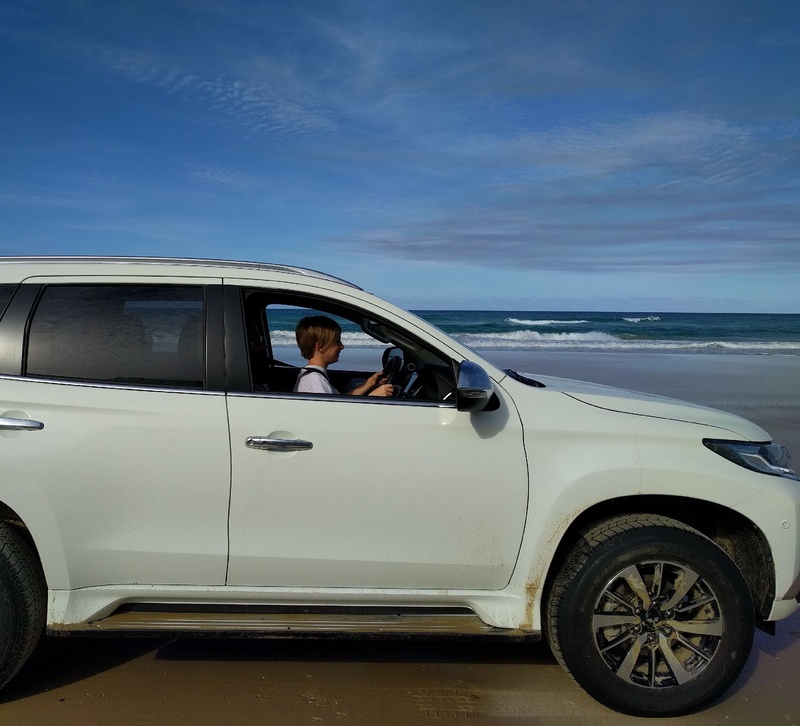 We got a 4wd rental car with the hopes we’d be able to check out this highway ON the beach. Literally on the beach. 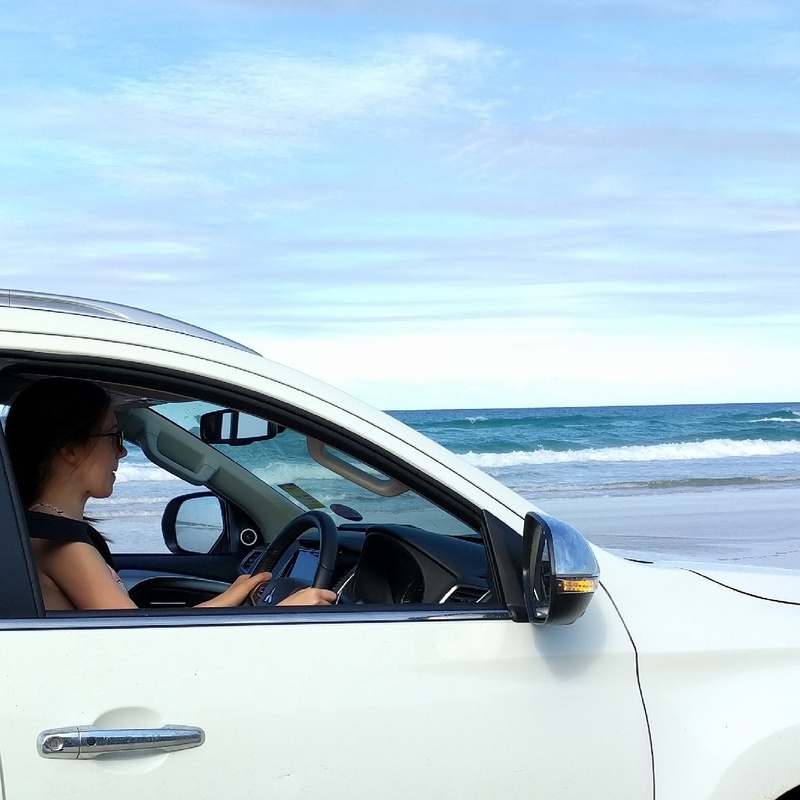 I’ve never driven on a beach before. 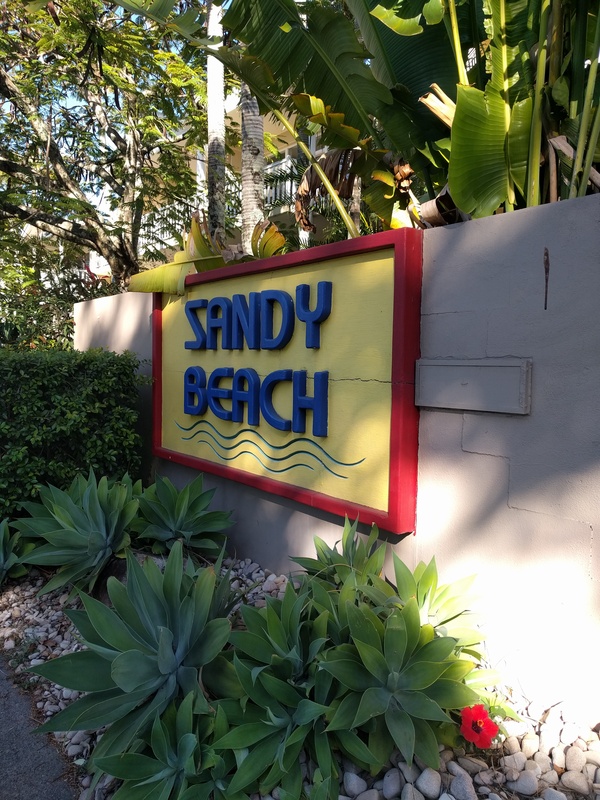 Wes had been to a beach in Florida where you pull on to the beach to park. But we were both curious about this. We got a permit, packed a lunch, and took off. About 15 minutes from our house was a car ferry to get across the river. 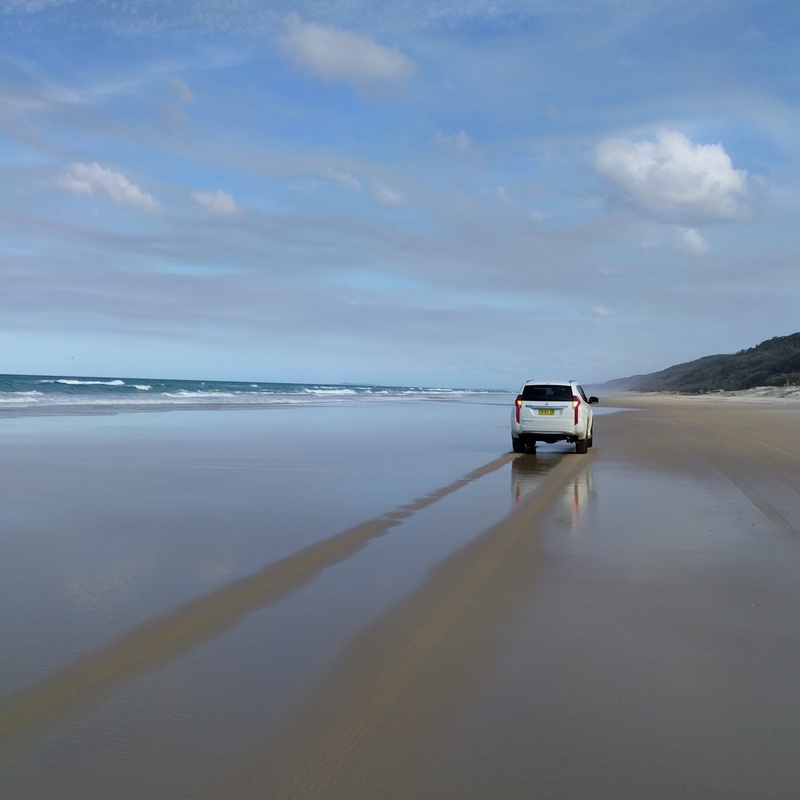 Then we drove about 10 min and saw the turn to get ON to the beach. It was incredible. 2 lanes of cars down by the water and you could pull over and stop anywhere. There were speed limit signs. People were also camping in some parts of this beach. We stopped along the way and had a picnic lunch. 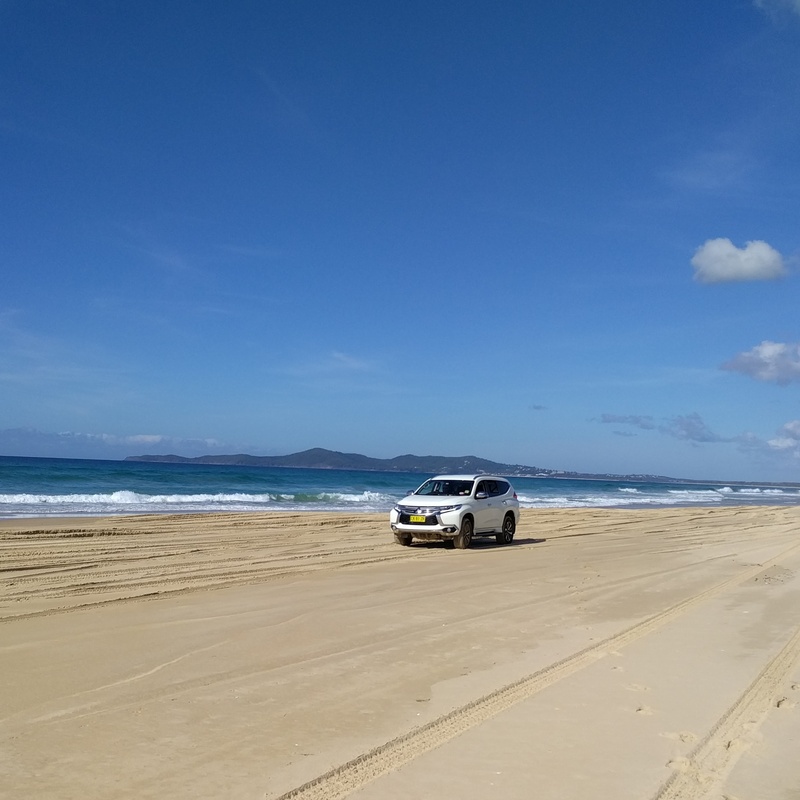 We had planned to cut over and see Rainbow Beach, but Wes was still very sick and the sand was really deep on the way toward Rainbow. We got stuck once and didn’t want to take any chances, so we headed back home. On the way back home we made a few stops. 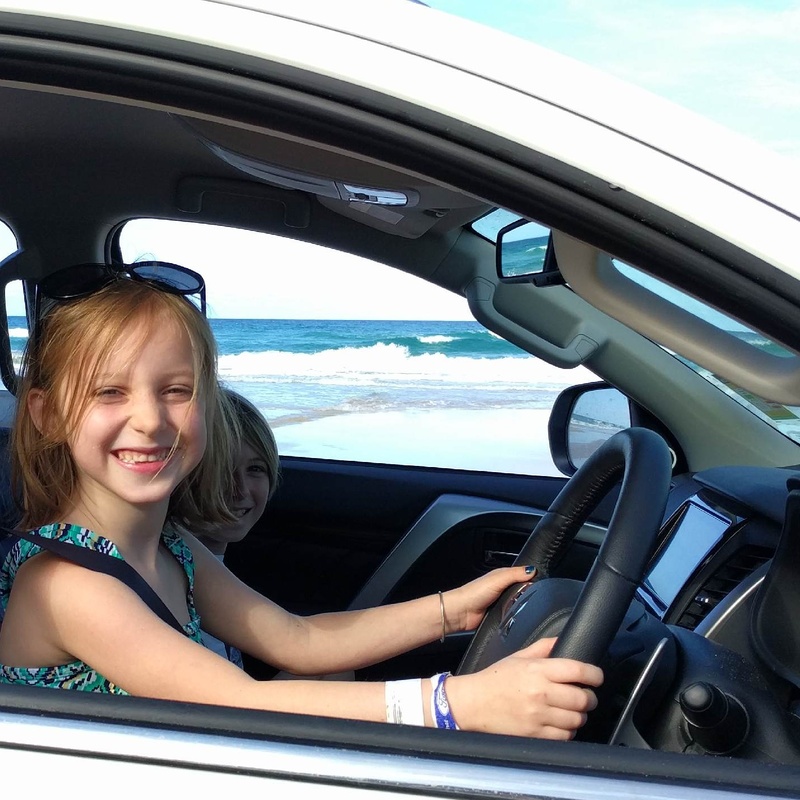 First, we let each kid drive. They sat on Wes’ lap and the big kids did the pedals. Their frist time driving will be memorable. They discovered red sand and played with that for a while. Then we spotted whales and watched them play. We ended our trip with some paddle boarding and shopping on Hastings Street. 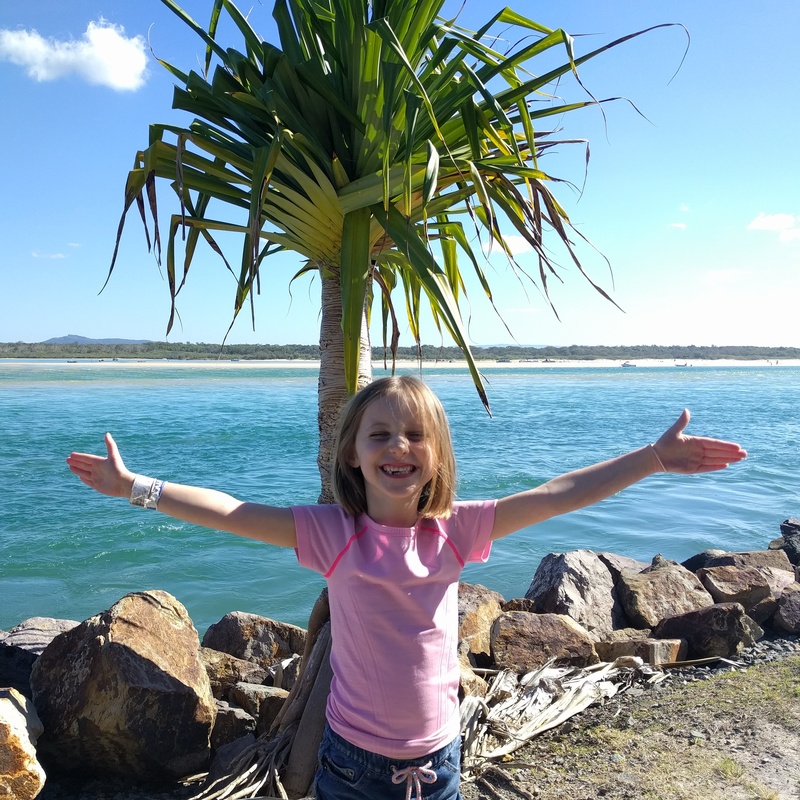 There was even more we could have done on the Sunshine Coast, but the zoo and beach driving were the highlights. This trip also included a doctor visit. First one since we have been here, so not too bad. 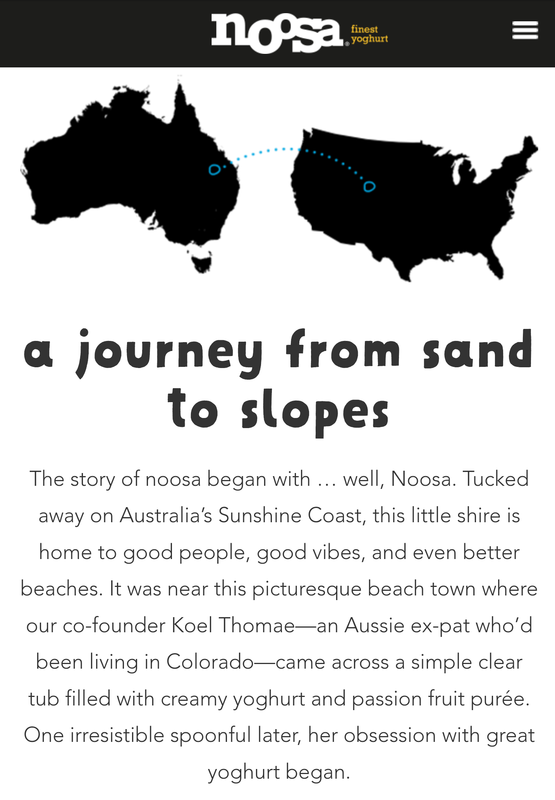 Wes probably won’t have great memories of Noosa, but I fell in love. The wifi was limited, so it was a great trip for Elle to catch up on summer reading and Mae & Luke made a ton of super cute videos together. This was the last of our touristing. Next up we have Brisbane. City. Only going because Wes has a work conference. 6 nights. Hotel. 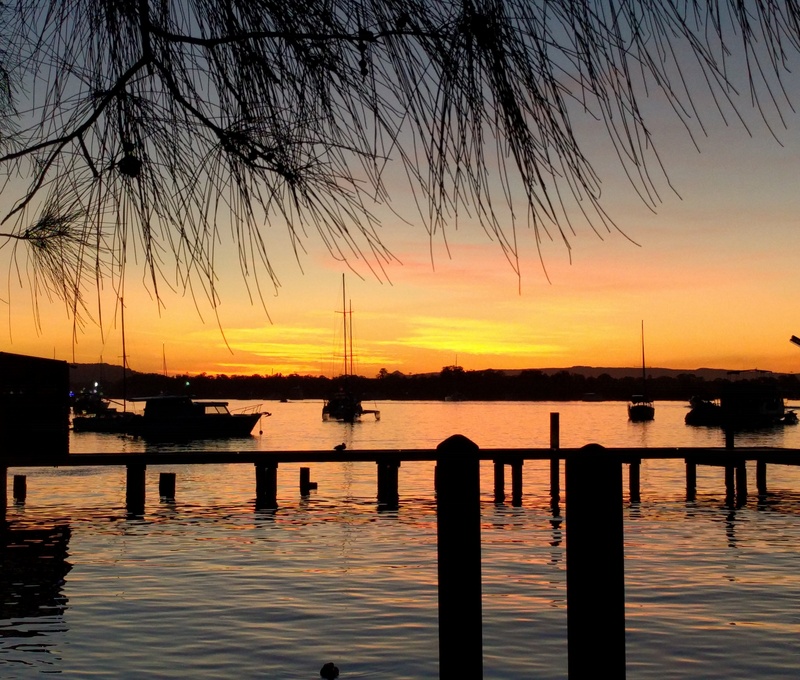 Can’t believe in 10 days we leave Australia.